The Hood of a 1911 barrel is one of the most visible and yet most overlooked portions of the pistol. Yes, the Hood is the shiny part of the barrel that you can see looking through the top of the ejection port. It’s often stamped with a company log, or caliber designation, and provides a great deal of visual flare to the gun. 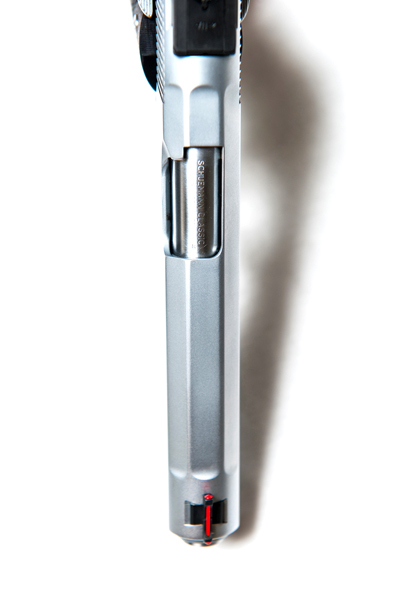 However, most people overlook how important this portion of the barrel is to the function of the 1911. Each time your 1911 fires, the Barrel unlocks and then returns to battery. How consistently it returns to battery is significantly influenced by the Barrel Hood’s fit to the Breech. The Hood fit also has a significant impact on how reliably the gun cycles. If the Barrel Hood has excessive clearance in the Breech Face, the barrel will not lock up in exactly the same positon from shot to shot. This causes minute differences in the bullets trajectory yielding poor accuracy. In extreme cases, a sloppy fitting Hood can cause misalignment as the barrel tries to return to battery resulting in poor reliability. If the Barrel Hood is fit too tightly, the barrel may be under stress during lockup causing it not to return to the exact same position from shot to shot. Again, accuracy suffers. An excessively tight barrel hood fit can also cause reliability issues due to its low tolerance for foreign debris like powder residue or dirt. At Bill’s Custom Automatics we use precision ground surface plates and digital height gauges to establish the exact Hood dimensions necessary to yield optimum accuracy and reliability. Hoods are then milled to those exact specifications using barrel fixtures and DRO controlled milling equipment. This level of detail is provided to the Hood fit and every other aspect of your BCA 1911 ensuring they are the finest pistols available anywhere. At Bill’s Custom Automatics we only make one class of weapon, World Class!